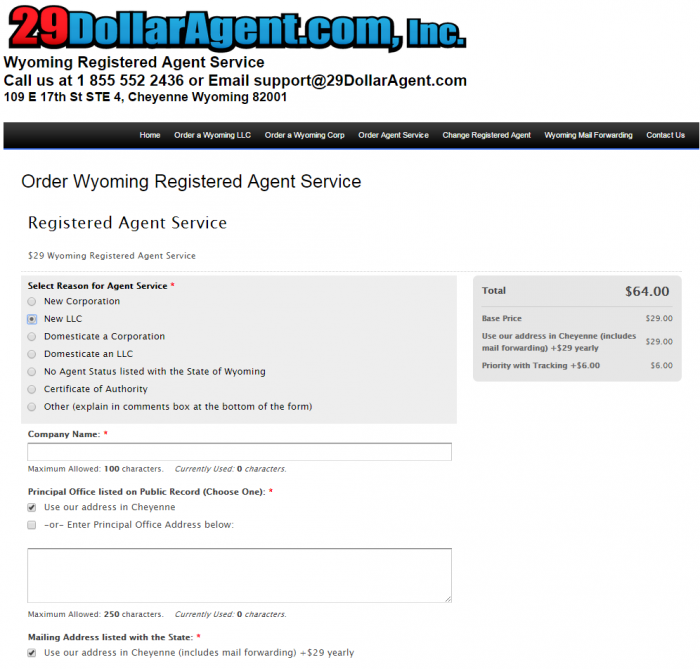 This Wyoming Registered Agent list was made March 1, 2015. A Wyoming registered agent service may change their prices or policies about what’s included in Wyoming registered agent service, mail forwarding, or what you can list an address down for at any time. 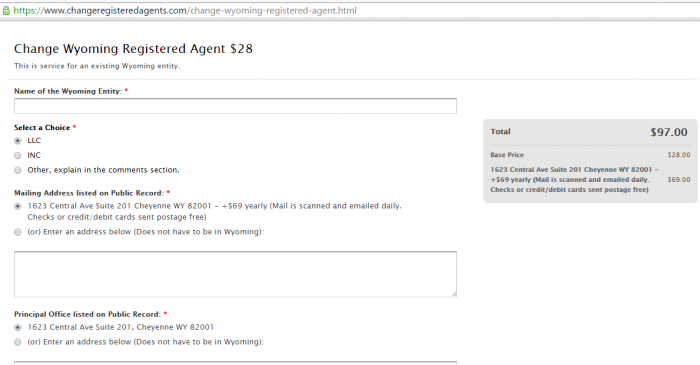 We do not guarantee this is current pricing for any of the Wyoming registered agents on this listing. We do not support Wyoming registered agent reviews. There’s a lot of choices out there when Googling a Wyoming registered agent. 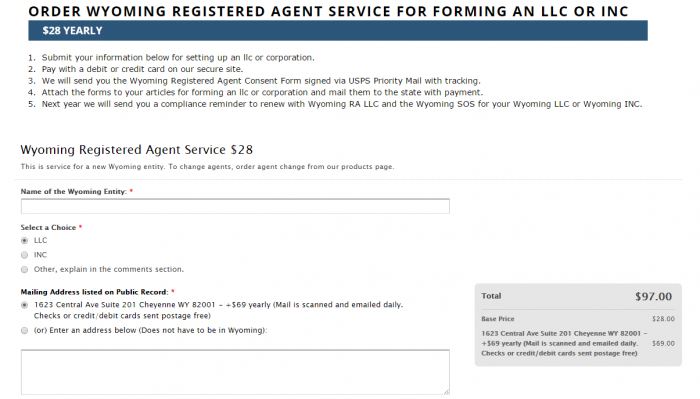 Wyoming Registered Agent Services LLC charges $25 a year. There’s no other options for payment. 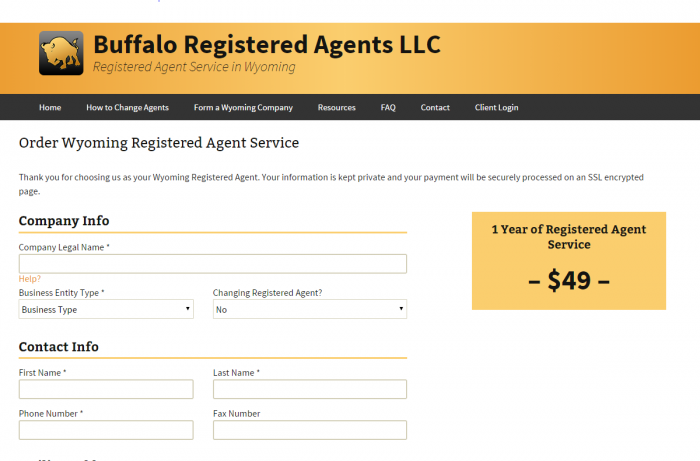 Our goal is to be the economical choice for registered agent services in Wyoming. We minimize our overhead so that you save. We don’t play games. We charge you the same price to renew. In fact, we have never raised a price on a client. 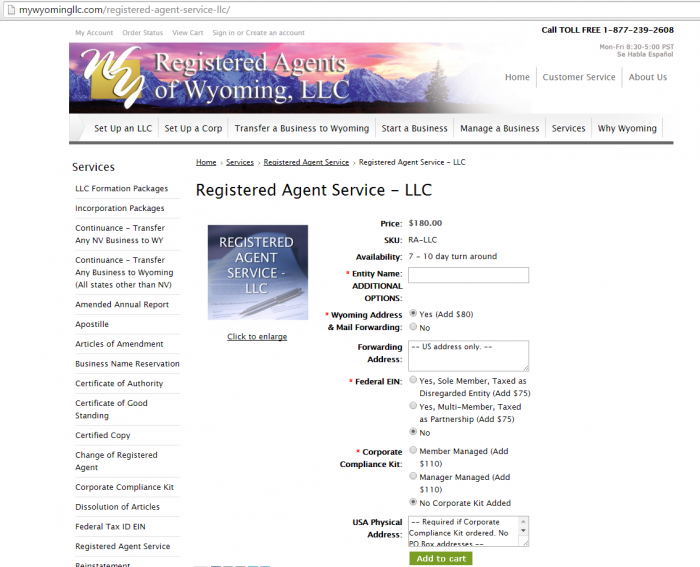 People hiring a registered agent in Wyoming are often looking for privacy. In order to get privacy, many want to list the registered agent address as the principal address, mailing address, registered agent address, and the organizer address, which we allow you to do in our all inclusive $25 a year price. 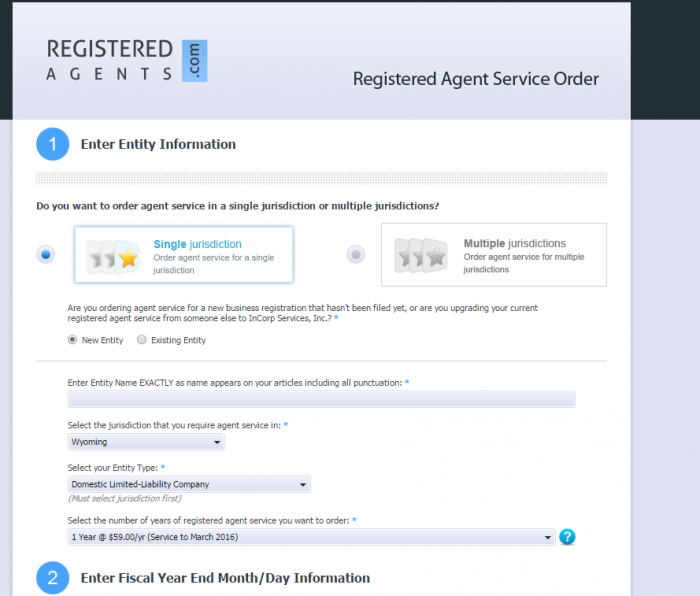 As you can see others will say they charge a low fee for registered agent services, but somehow pick out things that registered agents think of as standard, and by the time you’re done, you can end up spending a lot more money. 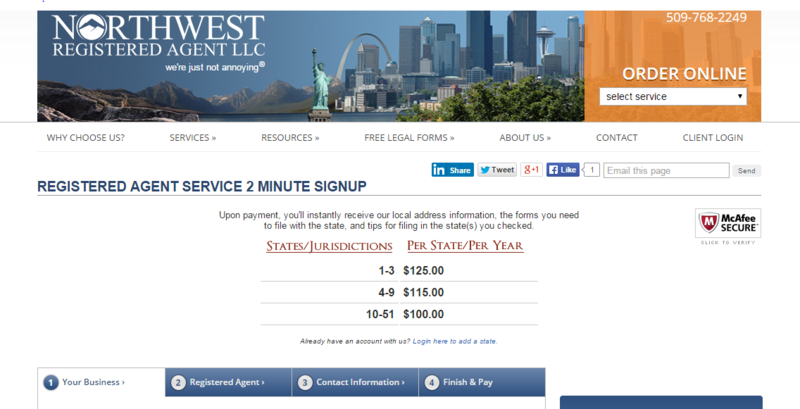 Once you sign up, you will be immediately logged into your online client account. 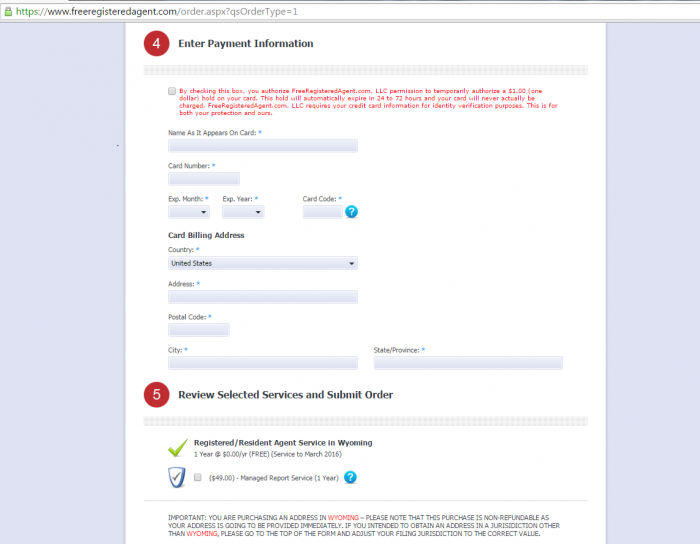 There, you will have access to all the same state forms you would find on the different Wyoming business sites. 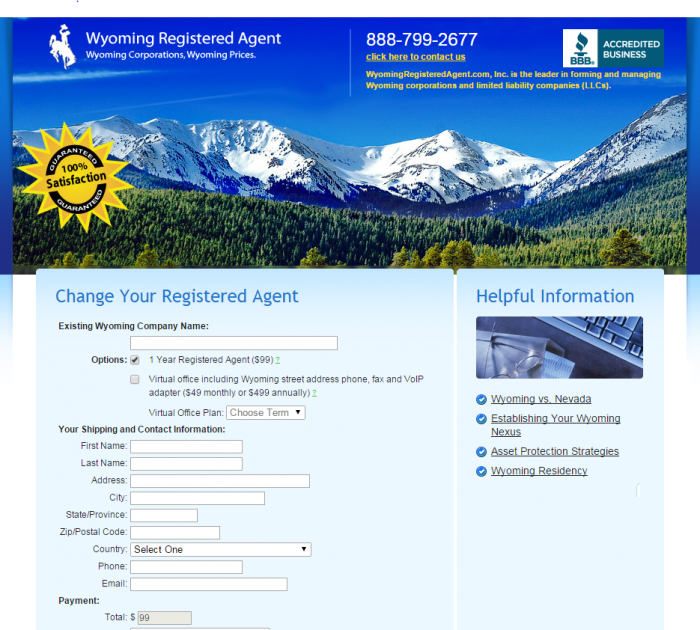 Your forms are already pre-filled with our information correctly and we include tips on how to make the filing in Wyoming. BUT, if you’re changing agents to us, we will process the change automatically upon your order being placed. If you’re wanting to form a new Wyoming company and keep your name off of it, you should have us do it for you, for a total of $150. You can order a new Wyoming Company here. A year from now, you’ll get a renewal invoice for $25. We provide auto-reminders and compliance tools for your filing requirements and annual reports. We scan any SOP and documents we get for you into your online account the same day we receive it. It’s simpler than many people make it, which in turn allows us to pass on the savings to you.